Holy crab! The beaches of Southern California are red and crawling, as thousands of marine squat lobsters ‒ better known as pelagic red crabs or tuna crabs ‒ are taking the coastline by storm. Warm water conditions have caused the mass stranding. 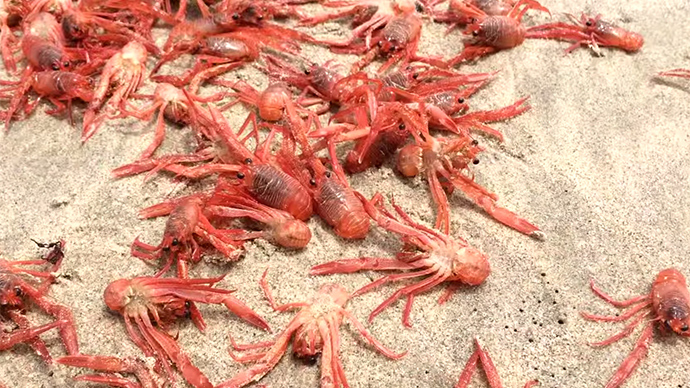 Donna Kalez was walking along the beach in Orange County, California, when she saw the beach teeming with small, red crustaceans. More of them came in with every wave. Marine Safety Lt. Michael Beuerlein told the Laguna Beach Coastline Pilot that he hadn’t seen a similar occurrence in 34 years with the city of Huntington. "There were thousands of them near the pier area, probably from tower one to tower six," Beuerlein said. "They flopped up on the shore and they were alive, and then they weren't." Unfortunately for the tuna crabs, that sudden death on shore isn’t unusual. "Once they are on the sand their life cycle has typically come to an end," Marine Protection Officer Jeremy Frimond told the Coastline Pilot. "However, some may still move slightly as their death is not instant once beached." But the circle of life has been a boon for gulls and crows, which have feasted on the tuna crabs. "This might look like a bad day for the red crabs, but it's a good day for shorebirds who rely on them to survive," Frimond said. "It's the ecosystem at work." Some beachgoers have tried joining in on the feast, too. "I heard they were pretty salty," Newport lifeguard battalion Chief Brent Jacobsen told the Coastline Pilot. The three-inch-long tuna crabs’ ‒ scientific name Pleuroncodes planipes ‒ normal habitat is the shallow waters on the continental shelf west of Mexico, though they can be found as far south as Chile. 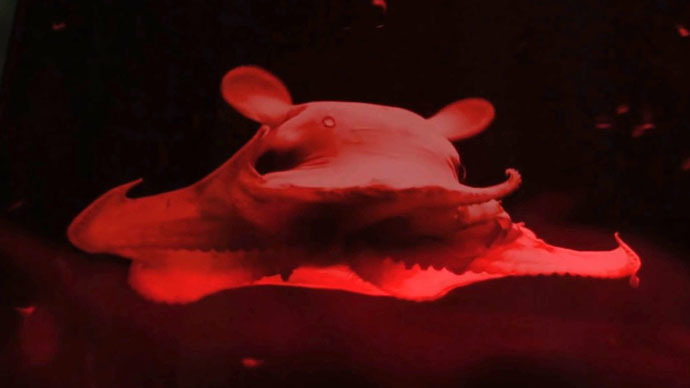 "These animals move with ocean currents. Sporadically these currents point the animals inshore and the result is what we have been seeing on our beaches the past few days," Frimond said. Experts believe this year's El Niño conditions ‒ bands of abnormally warm water have swept up the Pacific Coast since the waning months of 2014 ‒ might be responsible for the tuna crabs appearance from San Diego up to Orange County. "They have this ability to transition from the seafloor through the water column," Linsey Sala, collection manager at University of California San Diego's Scripps Institution of Oceanography, told the Washington Post. "They're subject to current and internal waves and tides, so they can be pushed along with different water masses. Typically, when we do see larger numbers of tuna crab, it's during warm water intrusions." 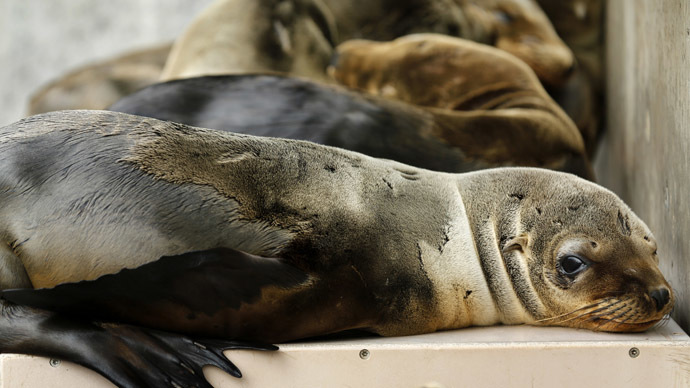 El Niño-type conditions were blamed for thousands of starving sea lion pups washing up on shore in California. Many of the animals were on the brink of death. "It's been a really unusually warm year, and disruptive to the normal marine food web, from Baja all the way up to Alaska," Nate Mantua, a climatologist with NOAA's Southwest Fisheries Science Center, told National Geographic. 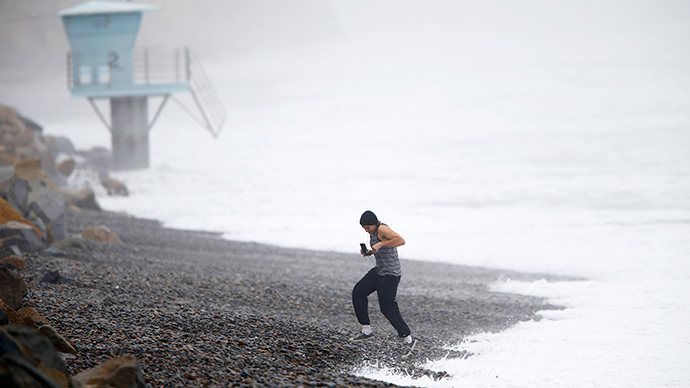 NOAA officially declared an El Niño in March, but predicted it would “stay weak, have little influence on weather and climate." A massive patch of warm water off the US West Coast called “the blob” is also causing marine life to appear in unusual places, as warm water with less nutrients is disrupting ecosystems and food supply. The blob is contributing to warmer-than-average drought conditions in California, as well. In the spring, billions of small, bright blue jellyfish-like animals ‒ called “by-the-wind sailors” ‒ washed ashore all along the United States’ Pacific coastline, thanks to warmer water bringing them far inland of their normal open-ocean habitat, National Geographic reported in April. 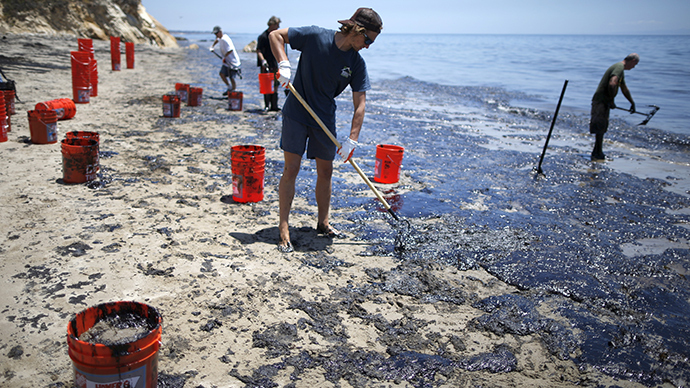 The mass strandings of by-the-wind sailors happen every three to six years, according to Kevin Raskoff, a marine biologist at Monterey Peninsula College in central California. Orange County Lifeguards Chief Jason Young told the OC Register that his staff is asking beachgoers not to touch or take the tuna crabs from protected marine areas in the county. Many people, however, are content to just photograph the spectacle. “Everyone is taking selfies with the red crab,” Kalez said.